Henri Lebasque (1865–1937), Sunset over Pont-Aven (1894), oil on canvas, 36.8 × 45.1 cm, Museo Thyssen-Bornemisza, Madrid, Spain. Wikimedia Commons. 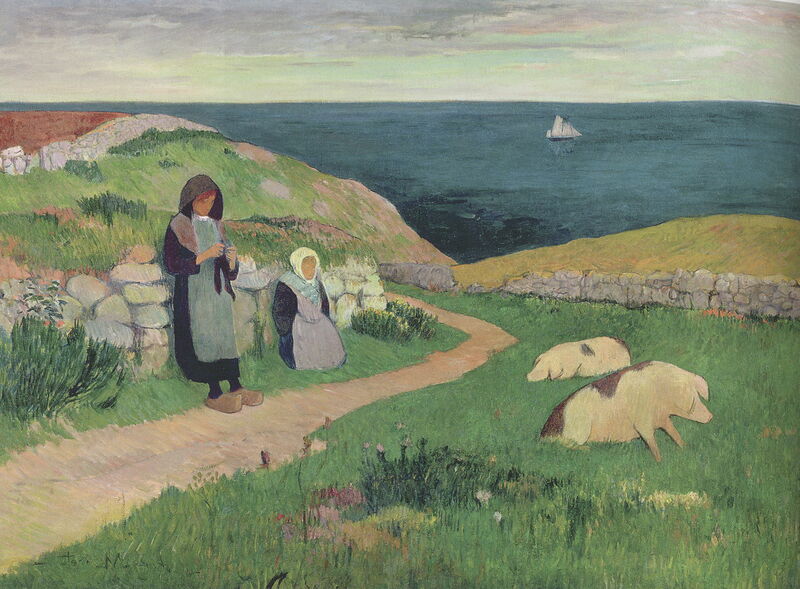 Visits to the Breton village of Pont-Aven by Paul Gauguin and Émile Bernard in the mid and late 1880s may have helped promote the colony’s reputation, but I think that its time had come in any case. From about 1888, a succession of avant garde painters arrived, and some stayed for the rest of their lives. Charles Laval (1862–1894) had trained in Paris at the École des Beaux-Arts, under Léon Bonnat, then in the Atélier Cormon. He arrived in Pont-Aven in the summer of 1886, and became a close friend of Gauguin, accompanying him to Panama the following Spring. There, the pair aimed to live like savages – which they quickly discovered was hardly practical. They went back to Martinique, from where Gauguin soon returned to France, but Laval remained longer. 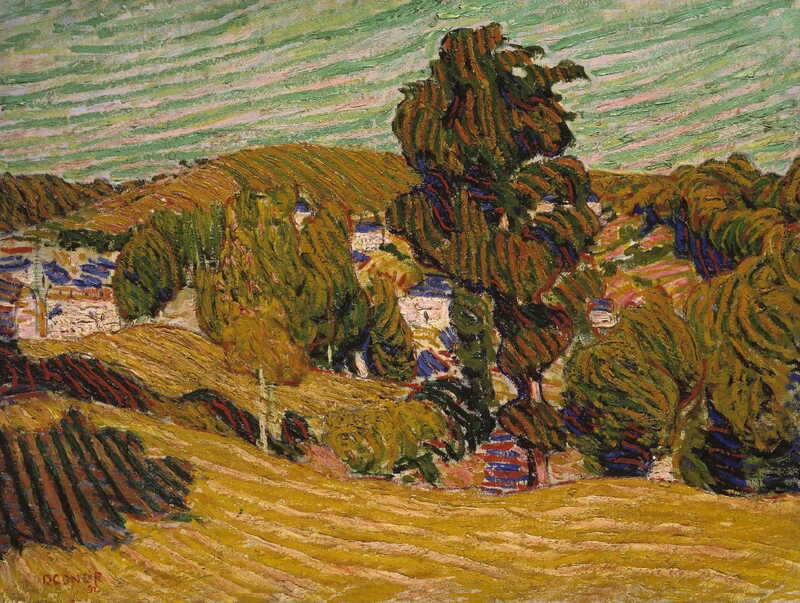 Laval was back in Pont-Aven by the early summer in 1888. Charles Laval (1862–1894), Harvest in Brittany (c 1889), oil on canvas, dimensions not known, Private collection. The Athenaeum. This image of Laval’s Harvest in Brittany (c 1889) is not particularly good, and I suspect its colours are oversaturated. 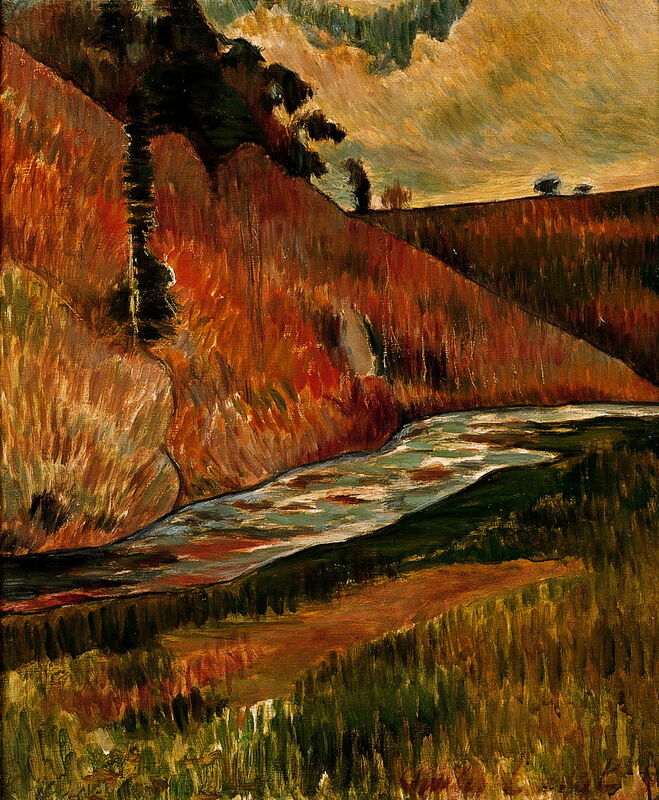 Charles Laval (1862–1894), The Aven Stream (1889), oil on paper mounted on canvas, 55 × 46 cm, Musée d’art moderne et contemporain de Strasbourg (MAMCS), Strasbourg. Wikimedia Commons. The Aven Stream (1889) appears to be an oil sketch made on paper, well upstream from the village of Pont-Aven. Charles Laval (1862–1894), Bretons se promenant (Bretons Walking) (1889), watercolor and gouache on paper, 38.9 × 59 cm, Private collection. Wikimedia Commons. 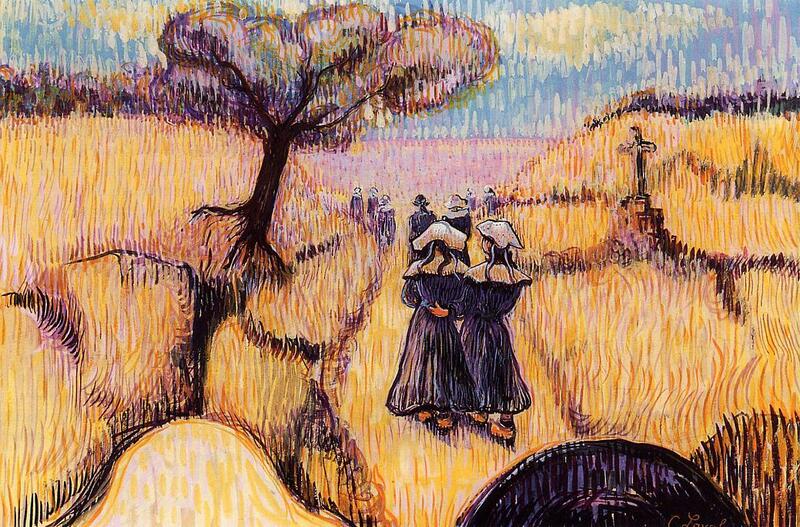 Laval’s watercolour of Bretons se promenant (Bretons Walking) (1889) uses a Divisionist-like effect, but with short vertical strokes instead of dots or horizontal tiles. Laval died from tuberculosis in 1894, at the age of only 32. Even worse, some of his paintings have been misattributed to Gauguin, which was profitable for their owners, but has not preserved Laval’s reputation. Henri Delavallée (1862–1943), Breton Woman from Pont-Aven (1892), oil on canvas mounted on cardboard, dimensions not known, Musée des beaux-arts de Brest, Brest, France. Wikimedia Commons. Henri Delavallée (1862–1943) should have become one of the best-known of the post-Impressionists. Taught at the École des Beaux-Arts by Carolus-Duran and others, and a friend of Gauguin, Bernard, Pissarro, and Seurat, it is hard to know why his paintings have almost completely vanished. He did paint some early Divisionist landscapes in and around Pont-Aven when he first visited the village during the 1880s, and was influenced by Gauguin and others from 1886 onwards. 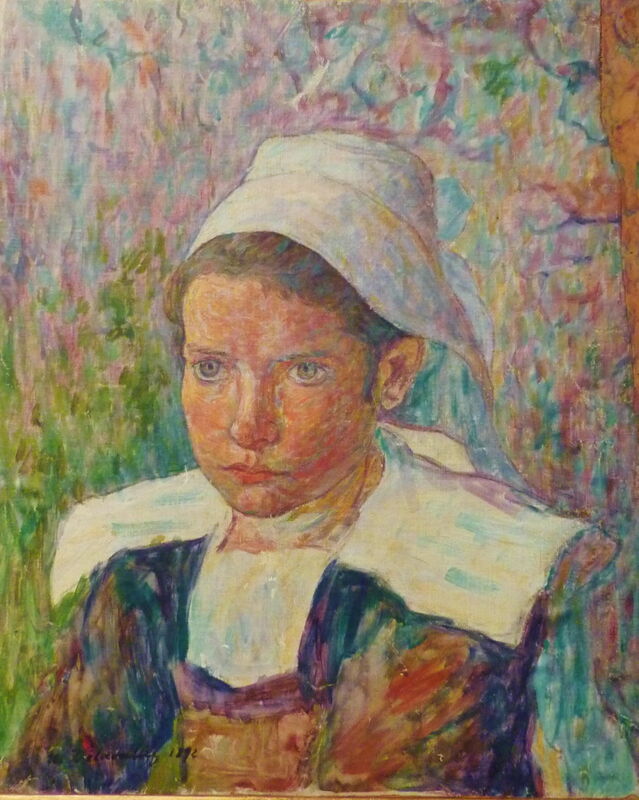 This rather later painting of a Breton Woman from Pont-Aven (1892) is one of the very few of his works which is now available as a good-quality image. Paul Sérusier (1864–1927), The Talisman (Landscape with Le Bois d’Amour in Pont-Aven) (1888), oil on canvas, 27 × 21.5 cm, Private collection. Wikimedia Commons. Paul Sérusier (1864–1927) was among the most radical, and The Talisman perhaps his most famous work completed at Pont-Aven in 1888. 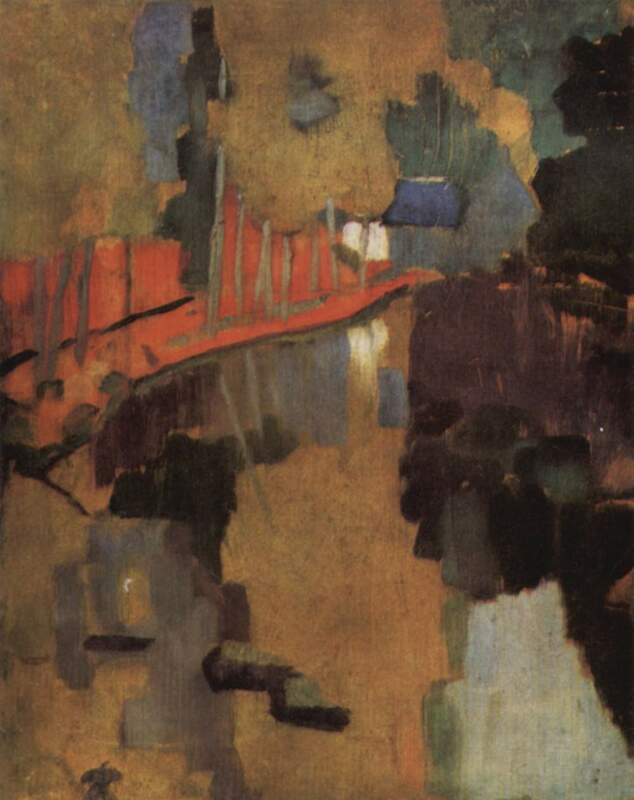 Explained as a ‘landscape with Le Bois d’Amour in Pont-Aven’, it was painted in close collaboration with Gauguin, and was a big step towards the abstract. He returned in 1889 and 1890, following which he pushed the frontiers of art towards the modernism of the twentieth century, first with the Nabis. Vincent van Gogh (1853–1890), Breton Women and Children (1888), watercolour, 47.5 x 62 cm, Civica Galleria d’Arte Moderna, Milan, Italy. Wikimedia Commons. Vincent van Gogh (1853–1890) didn’t paint at Pont-Aven, but corresponded with Gauguin when he was there in 1888, and sent seven of his paintings to the artists at Pont-Aven in October of that year, in return for works by Gauguin, Bernard, Laval, and others. Van Gogh seems to have had ideas of setting up his own art colony in Arles at that time, but those fell through when his relationship with Gauguin broke up. 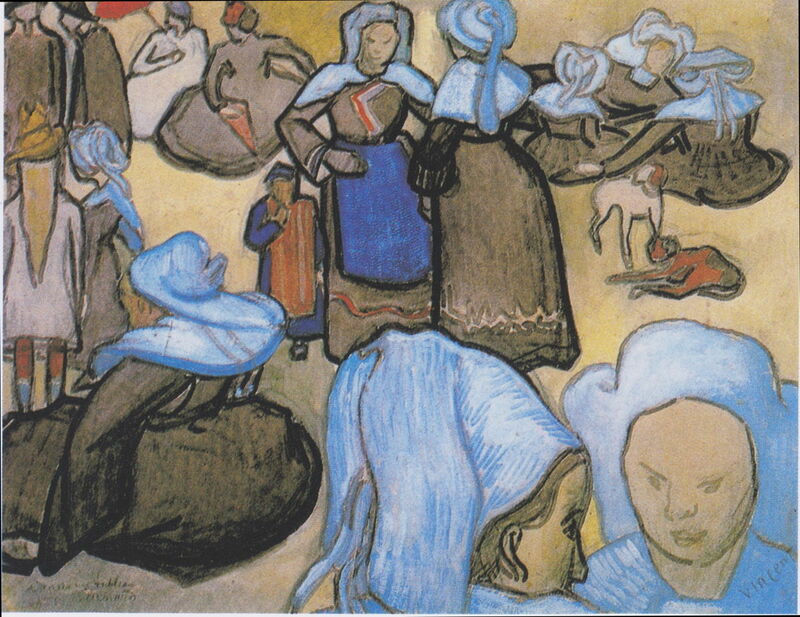 And curiously he made a watercolour after one of those works from Pont-Aven (I think by Bernard rather than Gauguin), Breton Women and Children (1888). Henry Moret (1856–1913) trained to paint in Salon style, and seems to have done so until he moved to Pont-Aven in 1888. When there, he is thought to have associated with Gauguin, Bernard, Laval, Sérusier, and others, and later moved to the coast at Le Pouldu. 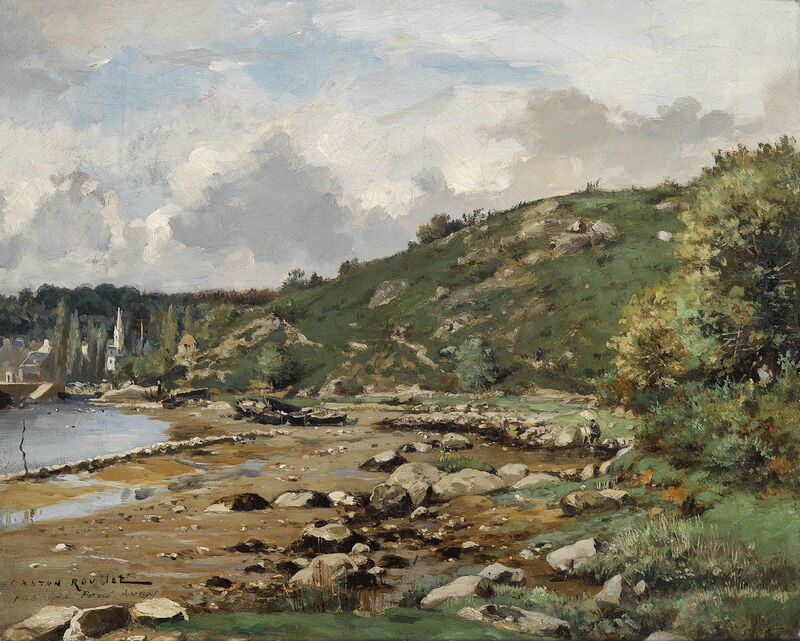 From there, he spent the rest of his career painting the coast and countryside of Brittany. The date given for his painting of Young Bretons is about 1900, but the similarities in style to the work of Gauguin and others made when they were at Pont-Aven around 1888-89 suggests that it may well have been painted when he was still in the village, at about that time. Roderic O’Conor (1860-1940) travelled from his native Ireland to Antwerp to complete his training. Following that, he lived in France, where he became influenced by the Impressionists. In 1892, he visited Pont-Aven, where he later became a friend of Gauguin, although his style seems to have developed more from Vincent van Gogh. 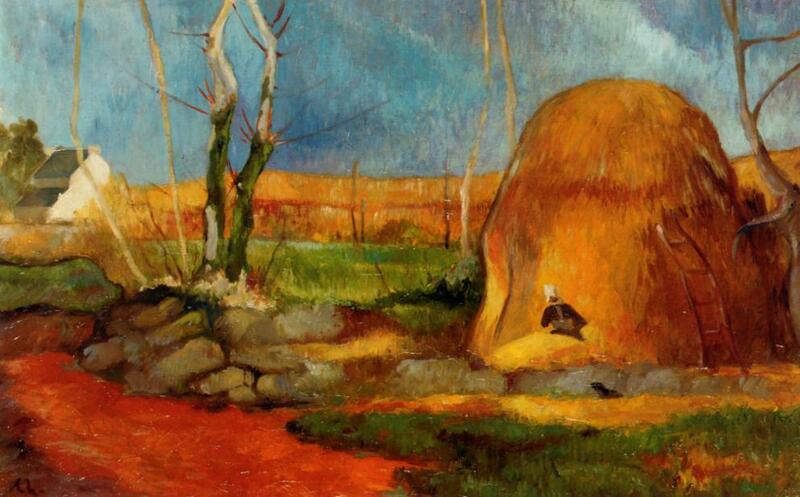 O’Conor’s Yellow Landscape was painted in the first summer that he was in Pont-Aven, in 1892. 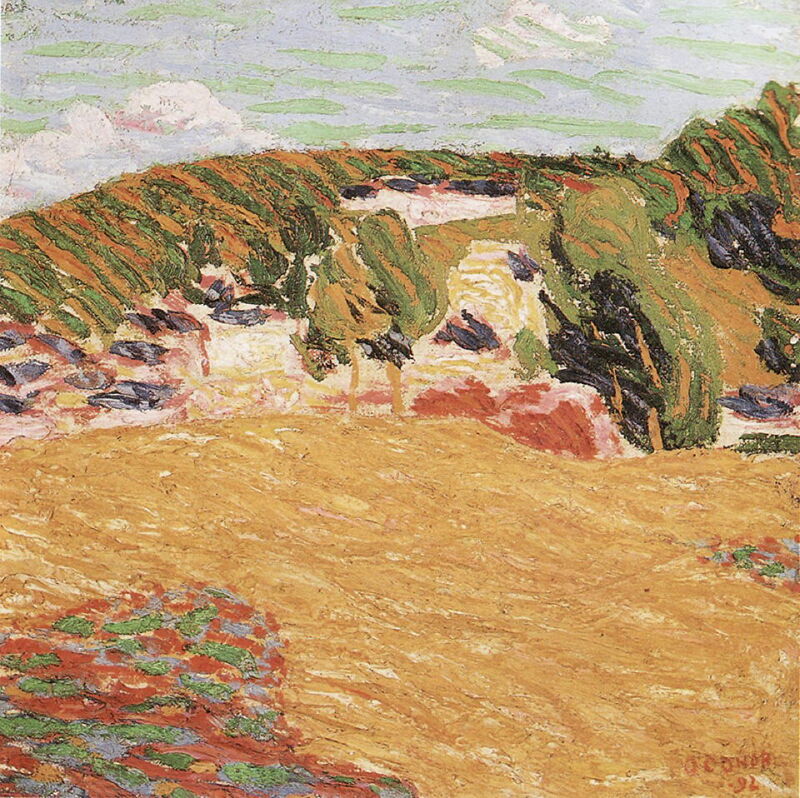 Roderic O’Conor (1860–1940), Field of Corn, Pont-Aven (1892), further details not known. Wikimedia Commons. Another painting from that same summer is his Field of Corn, Pont-Aven (1892). O’Conor spent much of the rest of his career in France, and lived in Paris in the early twentieth century, where he met and debated with the young author Somerset Maugham, and the infamous Aleister Crowley. 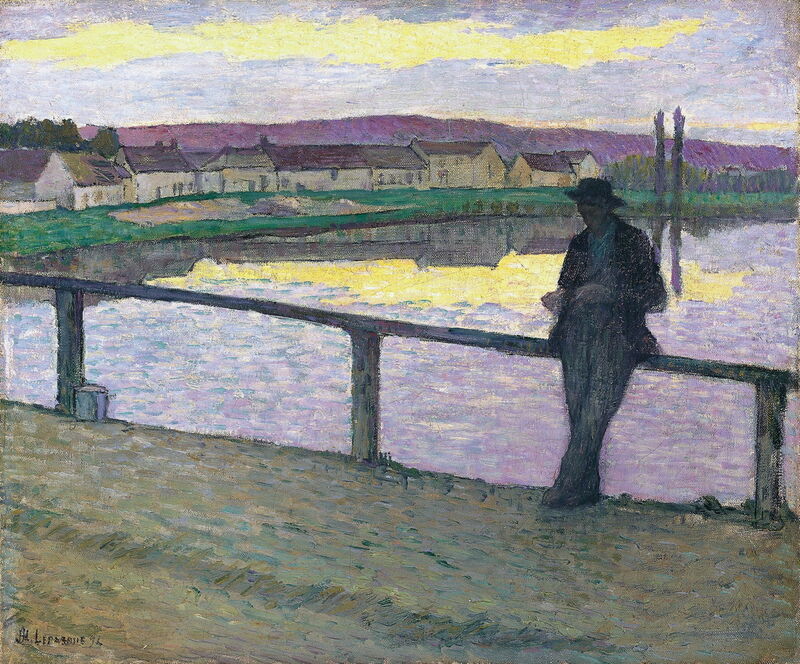 Henri Lebasque (1865–1937) was another pupil of Léon Bonnat, who painted Sunset over Pont-Aven (1894) during a visit to the village early in his career. He learned colour theory fom the Neo-Impressionists, had contact with the Nabis, then his style transformed again when he went to live in the south of France in the twentieth century. 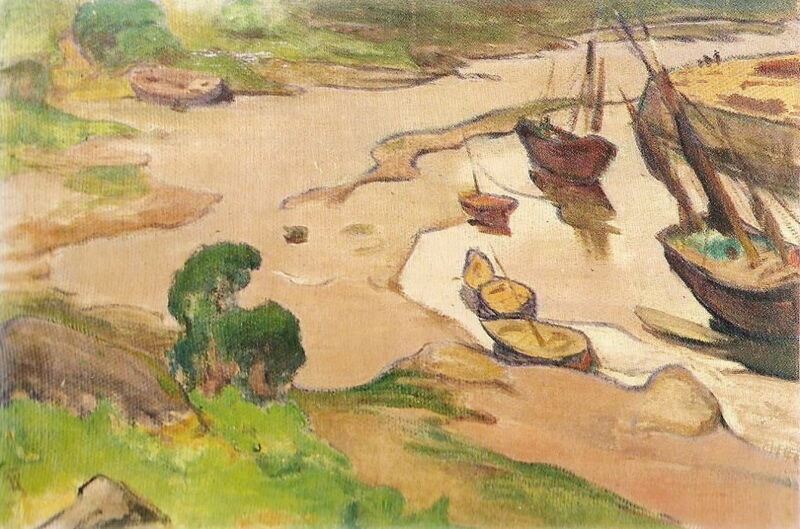 Władysław Ślewiński (1856-1918), Low Tide at Pont-Aven (1894), media and dimensions not known, Private collection. Wikimedia Commons. Władysław Ślewiński (1856-1918) was born and brought up in Poland, but fled to Paris in financial ruin in 1888. The following year he painted in Pont-Aven as a student of Gauguin, where he painted Low Tide at Pont-Aven in 1894. He moved to the coast at Le Pouldu at about that time. Gaston Marie Roullet (1847-1925), The Port of Pont-Aven (c 1900), oil on canvas, 38 x 46 cm, location not known. Wikimedia Commons. Gaston Marie Roullet (1847-1925) was a little-known realist landscape painter who painted The Port of Pont-Aven (c 1900) in the late nineteenth or early twenieth century. Alfred Guillou (1844-1926), Fishermen’s Wives of Pont-Aven (c 1900), oil on canvas, dimensions not known, Private collection. Wikimedia Commons. Alfred Guillou (1844-1926) was one of the few Breton painters who was associated with the colony at Pont-Aven, although he spent more time in the nearby artists’ colony of Concarneau, which he helped create during the 1870s. 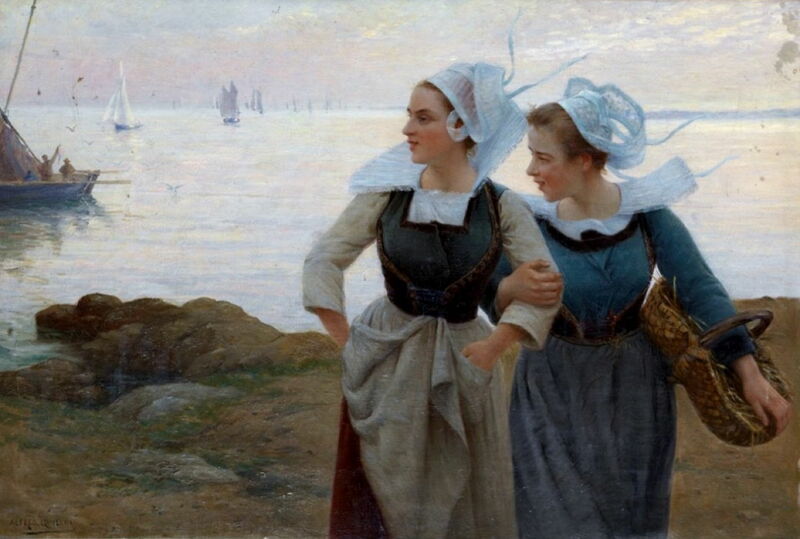 His painting of Fishermen’s Wives of Pont-Aven is thought to date from around 1900. Concarneau was smaller, and today is much less well-known than Pont-Aven. Among its visitors, though, were P S Krøyer, Jules Bastien-Lepage, and Cecilia Beaux. These three articles have, I hope, given you an idea of the wide variety of paintings which have been made at or around Pont-Aven, and of the rich range of their styles. Those of Gauguin, Bernard, Laval, and Moret, painted at Pont-Aven in the eight years between 1886 and 1894, clearly come from the same stylistic movement, which is often termed Synthetist. But before and after them – and, no doubt, in the work of others who were in Pont-Aven at about that time – there is no coherent style or approach to painting. It is therefore inappropriate to refer to a Pont-Aven School of art, but it would be much more meaningful to associate some of those who painted in Pont-Aven with the group and style centred on Paul Gauguin – Synthetists, if you wish. Not everyone who painted at Pont-Aven was a Synthetist, and not all Synthetists painted at Pont-Aven. Posted in General, Painting and tagged Delavallée, Guillou, landscape, Laval, Lebasque, Moret, O'Conor, painting, Pont-Aven, Roullet, Sérusier, van Gogh, Ślewiński. Bookmark the permalink.